I felt silly as I lay in bed all by myself with a stack of read alouds. Beatrix Potter was perched on my huge pregnant twin baby belly as I read out loud to the little ones inside. I guess I wanted to get an early start. I was ecstatic to be pregnant, and while it felt awkward at first, I soon grew to look forward to those quiet times. I had been infertile so long that it was my way of day-dreaming about coming motherhood. Reading aloud from children’s books was a big part of my concept of homemaking. In my way of thinking, reading children’s books aloud to your child would ideally begin as soon after birth as possible. Not only does it help with brain and speech development, but it develops healthy concepts of how to live life in many circumstances, it fosters bonding with your child and gradually trains them to be still for short times. If all parents understood the huge educational benefit and intense happiness brought about by reading aloud to their children, the TV might remain silent and might even become considered obsolete in your home. Radical thinking, this! Most people don’t realize that when a child is born, only twenty-five percent of the brain is developed, and the rest develops within the first year or so of life. during this crucial time in a child’s development will help tremendously as will lots of normal conversation. I firmly believed this (still do) and so nursed our twins (with a nursing pillow for twins) while reading to our 2 year old. If I had to do read alouds over again, I would have integrated the Psalms and other favorite portions of my Bible with other books when they were only 1 and 2 instead of waiting until I thought they could understand. I have often thought that Daniel in the Bible (Daniel 1: 3-5) must have had parents who taught/read to him about Almighty God from youth for him to not forsake his faith under the rigorous training and indoctrination when stolen away to the courts of the Babylonians. Ultimately, even being thrown to the lions didn’t daunt him (Daniel 6: 1-28). Timing– Choose a time for reading aloud that is relaxed, quiet, and conducive to listening. For us, the best time was right after lunch; others begin or end their day with a read aloud. As homeschoolers, finding time for everything within the regular school day is challenging, but read-alouds can be combined with other activities. For example, when our children were a bit older, I read aloud as they silently cleaned up from lunch, and while there was some guidance needed from time to time, it was a win-win – I loved it and so did they! Generally 10 to 30 minutes is appropriate. Atmosphere– Setting the tone is important, too. Gather everyone together on the carpet, lower the lights in the room, and have a special chair for you to read from or snuggle on the couch, rotating where they sit to avoid an argument. Let it become a stable and comfortable routine in the midst of our chaotic world. Make it relational! Book Selection– Charlie Tremendous Jones once stated, “You’re the same today as you’ll be in five years except for the people you meet and the books you read.” Books have the power to change us for good or for evil, thus the choice of a children’s book should have as its purpose to help our children identify with others of noble and faithful character. It is a window in time in which to develop integrity, compassion, purity, a love of truth and honesty, and a biblical worldview. 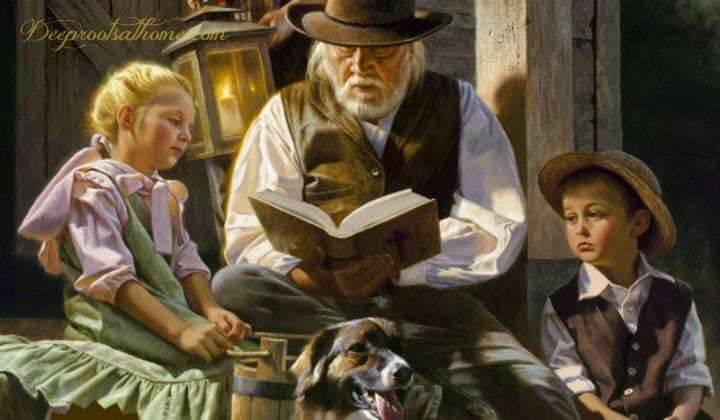 A book can be a powerful tool to influence a child for Christ. As our young sons and daughters keep company with these rich characters, it will help them form internal values for a lifetime. What are your favorite young children’s books and read alouds? I’d love you to share your read alouds in the comments. 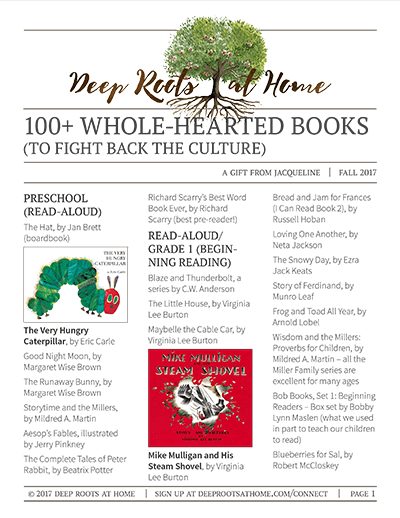 Check out other completely different booklists here at Deep Roots at Home! These titles look so sweet. Thanks for linking up with Literacy Musing Mondays. I really love “Guess How Much I love you”, “I’ll Love You Forever”, and Richard Scary books, among many! I just came across your blog, through a link on CHEWV. Thank you for the sound advice, and for not being afraid to speak your faith. I’m also thankful for the timely reminder that supervison is necessary when visiting the library. We have two little boys, and our daily story time is very special to us. Jolene, I an thankful it was helpful and encouraging to you! Praying right now for you, dear Mama, and your boys! May you and your family THRIVE in the Lord! !